Get the look you want with these Conair compact jumbo rollers. These handy rollers are 1.5 inches wide and heat up in just two minutes. My hair is about 3" below my shoulders, medium thickness, cut in layers, and has a moderate amount of natural curl--just enough to make it somewhat fuzzy in humidity and I use to use 1.5" curling iron to straighten and give body. These rollers are equivalent to a 1.5" curling iron, but much easier and quicker to use. I put one on top, one on each side, and two in back. It turns out perfect. Has cut my time in half it takes me to do my hair. By the time I am done blow drying my hair they are heated and ready to go. I leave them in while putting on my makeup. Don't know now how I managed without them. I have only used the Conair Instant Heat Compact Jumbo Rollers twice and was very pleased with the results. My hair is layered and with some of the other rollers I had wings sticking out, no problem with the larger rollers. I would recommend them highly. They will work great when on trips as the case is smaller than a complete set of rollers. I had been looking for a easy to use, large roller set in a compact size container FOREVER! In the meantime I bought half a dozen that did not work due to roller size and poor quality. This set will go with me everywhere I travel The clips are great and do not damage your hair, the soft padding on the rollers also protects your hair and it heats up instantly! The larger roller size gives you just enough curl. LOVE IT! These are great curlers, especially for the price. I read the product info. and reviews before purchasing, so was aware that it only comes with five rollers. They're great sized, larger rollers for looser curls and to add body. It would be great if there were more in the kit but I think it's designed to be compact. Either way, they heat up easily and after using the five, you can easily and quickly reheat to reuse. Only drawback is the clips that come to hold the rollers in, which hold super well, don't fit in the compact storage case with the rollers. At first I thought five rollers would not be enough but now am so happy with the number of rollers and the size of the unit. 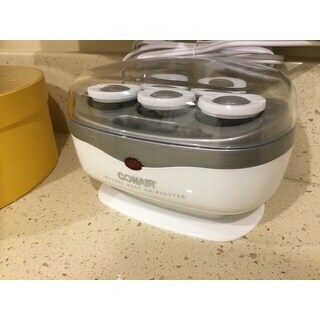 The size of the rollers is just right for me, the unit heats up super quickly, and storing it or packing it for travel is a breeze. One more thing -- the clips are easy to use. I keep them on the two cardboard strips in the package except I glued the two together to make one longer strip. Great design! Love these rollers. They heat up super quick and they come with these super clips that work really well to keep the rollers in place. After about 10 minutes they make my hair super curly and it lasts most of the day. I would recommend these! I love the jumbo rollers. They heat fast and curl my hair just enough without being too curly. The only down side is there are too few rollers. I wish they make a set with double the amount of rollers. These rollers are just what I was looking for. Small and compact with nice large rollers. They heat up very quickly and do a nice job. Nice value for the $$. 5 big hot curlers to supplement my blow drying. This includes 5 wire pins to hold the curlers in place. I have short, chin length hair and use these for curve and body. I didn’t want or need a big elaborate curler set. I just wanted a few hot curlers to help me out when I was creating a bouncy do. This is perfect, small and fits on my vanity. This is my second kit. I needed more than five rollers for my hair and wish they come in few different amont of rollers in it. It's a very fast and efficient way to get your hair done in few minutes. I used to have such kit in my very youth and I still admire it. These are great curlers, but I only give them a 4 because they don't come with any metal clips. Just the plastic butterfly type. 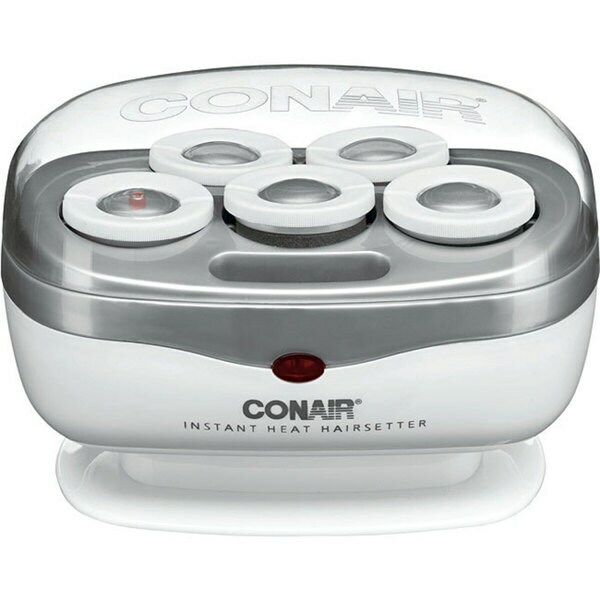 I have since ordered some from Conair because I couldn't find them anywhere. They are backordered for at least a month! Gave these to my daughter-in-law who years later when she cut her hair short, gave it to my other daughter-in-law! Works well in a jiffy. Love them. And even better bought with my award points and paid one penny for it, yes fokes 1 cent!!!! Happy lady!! They work as described. Heat is fast and rollers do not burn your fingers. I wish they would offer more, there are too few for long hair. Order Two! these are great. they do not make my hair dry. The rollers give my hair a lovely bounce. Not worth the price. Wouldn’t buy again. Christmas gift for a friend. Special request. I figured it would be the perfect size to take with me when I travel.